China’s White Paper points out that the most important thing in “one country, two systems” is upholding China’s sovereignty. 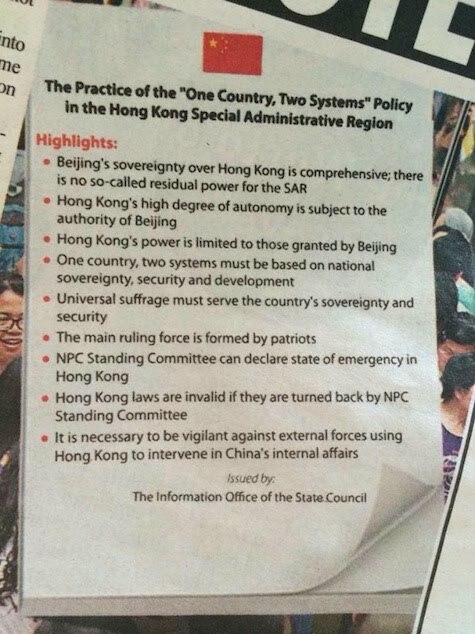 The White Paper explicitly states that “two systems” is subordinate to the “one country” principle. This means that China will allow the HKSAR to have capitalism, limited democracy and autonomy (for 50 years) but Beijing reserves the right to take action to protect China’s sovereignty and the “unity” of the nation wherever and whenever China feels it threatened. Such actions could be directed at perceived threats from Hong Kong residents who protest against China or the Communist Party. Official Chinese commentators have noted that the People’s Liberation Army garrison in Hong Kong could be mobilized if necessary. In a conflict between China’s “sovereignty” and Hong Kong’s “autonomy,” Beijing makes clear the winner will always be China’s sovereign rights and powers. The Basic Law is the HKSAR’s mini-constitution and governs the administration of the HKSAR.<FN6> Under the Basic Law, Hong Kong’s courts have jurisdiction over all local civil and criminal laws (except as to defense and foreign affairs) and the right of final adjudication. China allowed Hong Kong to retain the common law system that Britain had used in its former colony, including the concept of judicial independence. However, the White Paper reiterates the Standing Committee of China’s National People’s Congress (NPC) has the right of interpret and amend the Basic Law and this includes the right to review judicial decisions by Hong Kong courts that may interpret the Basic Law. The White Paper calls upon Hong Kong courts to consult the NPC Standing Committee before making any decisions on interpretation of the Basic Law. Perhaps the most troubling provision of China’s White Paper is the section which states that above all else, the people who govern Hong Kong should be “patriotic” and “love the country.” In fact, the White Paper explicitly states “loving the country is the basic political requirement for Hong Kong’s administrators.” If they are not patriotic or cannot be loyal to China, then the HKSAR will deviate from the right direction and put Hong Kong in jeopardy, according to the White Paper. This is a clear signal that Beijing will only tolerate “loyal” subjects to rule Hong Kong and, of course, China means loyal to the Party. Beijing has promised Hong Kong full universal suffrage by 2017 (20 years after China took over Hong Kong). While the White Paper states that Hong Kong citizens will be allowed to directly elect their Chief Executive in 2017, it also states that the chief executive “must be a person who loves the country and Hong Kong.” This means that Beijing will control the roster of candidates and must pre-approve the list of candidates for chief executive. If Beijing does not approve a candidate for chief executive, or if Beijing decides Hong Kong’s chief executive is not “patriotic” enough, Beijing could nullify his/her election or remove him/her from office. The people of Hong Kong are struggling with important issues: democracy versus communist party rule, their identity as Hong Kongers versus Chinese citizens, and how to protect their way of life from an authoritarian government in Beijing that is intent on eroding as many basic freedoms as it can get away with. Fortunately, it appears that many Hong Kong residents are becoming inspired to stand up for what they believe in, regardless of the demands and threats from Beijing. China does not offer Tibet the “high degree of autonomy” given Hong Kong, which is based on Article 31 of the PRC Constitution. Tibet’s nominal autonomy is based on Article 4 of the PRC Constitution<FN10> and China’s Regional Ethnic Autonomy Law (REAL).<FN11> Under the REAL, Tibet is given far less autonomy than Hong Kong. For example, China has never promised Tibetans they could one day elect their regional leaders and clearly Tibetans enjoy far fewer freedoms than Hong Kong residents. So China’s White Paper on Hong Kong may have limited relevance to Tibet because China is disinclined to give Tibet the expanded autonomy and freedoms that Hong Kong currently enjoys. Interestingly, one unintended benefit of the Partial Middle Way being so vastly short of the autonomy practiced by Hong Kong is that it gives a perfect rebuttal to China's claim that it represents "covert independence." If China accepts Hong Kong's relatively greater "high degree of autonomy" (in China's own words), then it is hard for China to have a principled objection to Tibet seeking far less. Or at least, China might reject it on other grounds, but it is impossible to seriously consider the Partial Middle Way as "covert independence" if Hong Kong remains part of China with far more freedoms. Although the Partial Middle Way asks for less than the substance of Hong Kong’s autonomy, the current CTA leadership has at times stated that Article 31 of the PRC Constitution could apply to Tibet (although China has expressly rejected this proposal).<FN13> If Article 31 is relevant, then naturally China’s views on Hong Kong’s autonomy are extremely relevant. China’s White Paper on Hong Kong’s autonomy sheds light on how China views this form of autonomy and the “one country, two systems” formula. Assuming for the sake of discussion that China were to give Tibet a “high degree of autonomy” similar to Hong Kong, it would surely be with the same limitations. Such autonomy could be revoked or constrained at any time, and there would be no independent enforcement mechanism. Tibet would likely have no more ability to enforce the deal than it did in the 1950s under the Seventeen Point Agreement. China would have the right of final review on any cases concerning Tibet’s autonomy, and the Communist Party would make sure only “patriotic” and “loyal” Tibetans could govern Tibet. Regardless of what form of autonomy the CTA is seeking for Tibet, China’s White Paper on Hong Kong should give Tibetans some concern. A realistic look at this issue presents an opportunity for those who care about Tibet’s future to be clear about the hard choices that various approaches involve. If the dialogue between China and the CTA resumes, the Tibetan side should take care to address these issues in detail. Such an honest, pragmatic conversation about the practical challenges of various policy options would greatly improve the democratic culture in Tibetan exile society, and would likely lead to better decision-making as well. 1. http://news.xinhuanet.com/english/china/2014-06/10/c_133396891.htm. Alarm in Hong Kong at Chinese white paper affirming Beijing control, http://www.cnn.com/2014/06/11/world/asia/hong-kong-beijing-two-systems-paper/. 12. http://tibet.net/2013/08/25/lobsang-sangay-tibets-prime-minister-in-exile-rallies-tibetans-in-portland-2/. See also the Sikyong’s comments to the Council on Foreign Relations “That is -- that is what we seek. Now, you raised a very important question, whether Hong Kong be a solution. As per Article 31, a specially administrated region is allowed in the Chinese constitution based on that -- basic law was drafted, and one country, two system was allowed. And that is allowed for Macau. Hence, what I say is that Tibet is not a constitutional challenge for China, because there is already a constitutional provision -- Article 31. . ..” http://www.cfr.org/tibet/conversation-sikyong-lobsang-sangay/p30679.